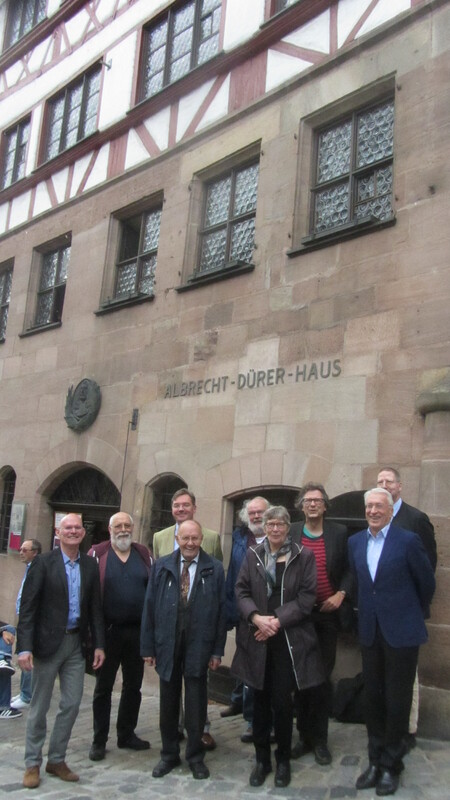 I spent Friday evening and all day Saturday at a conference in the Albrecht Dürer House in Nürnberg. You might ask if I suddenly moved over to the art historians but this was a history of astronomy conference. Dürer wrote an important maths book, which was published in 1525 and which I’ve blogged about in the past. However this wasn’t his first excursion into the mathematical sciences, in 1515 he was involved in the production and publication of the first ever (in Europe, there are earlier Chinese woodblock star chart prints) printed star maps. The conference that I intended was to celebrate the five hundredth anniversary of this historical event. These star maps or charts are often erroneously referred to as Dürer’s star maps, although in fact Dürer was only one of three people responsible for their creation and was viewed as the junior partner. If you look at the bottom left hand corner of the southern hemisphere map there are three coats of arms. Going from right to left, the first one consisting of a pair of open doors is Dürer’s; the family name being originally Türer, meaning porter, which comes from Türe the German for door. The second a sword flanked by two stars is Conrad Heinfogel’s a priest and astronomer and the third the imperial eagle surmounted by the poet’s laurel wreath is the coat of arms of Johannes Stabius mathematicus and Imperial Historian. The Latin text immediately above the three coats of arms states that Johannes Stabius commissioned the piece, Conrad Heinfogel positioned the stars and Albrecht Dürer circumscribed the images. Johannes Stabius (real name Stöberer; before 1468–1522) was a graduate of Ingolstadt where he became professor of mathematics. He moved with Conrad Celtis to Vienna where he became part of the so-called 2nd Viennese School of Mathematics as well as being appointed Imperial Historian. He is most well known today for the Werner-Stabius cordiform map projection. 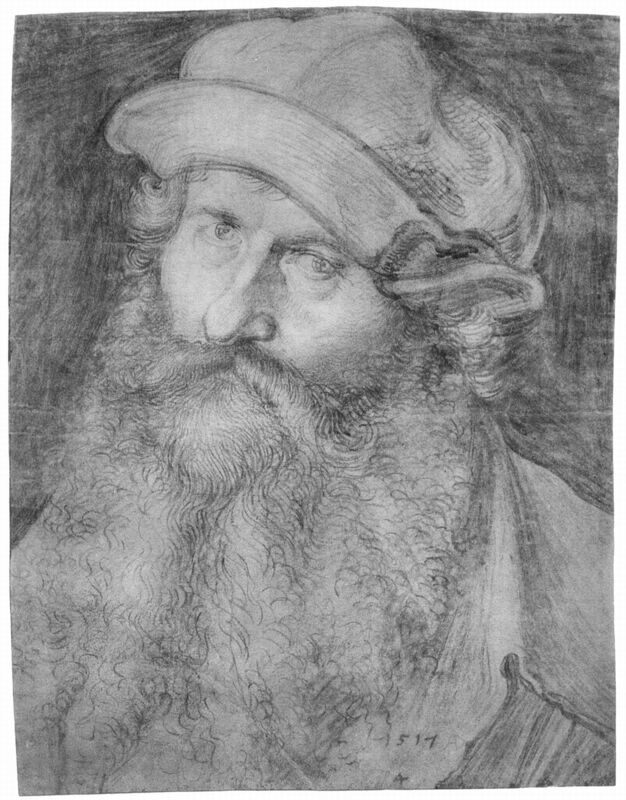 He had strong connections to Nürnberg and had previously worked with Dürer on the Triumphal Arch for Maximilian I, one of the largest ever woodblock print. 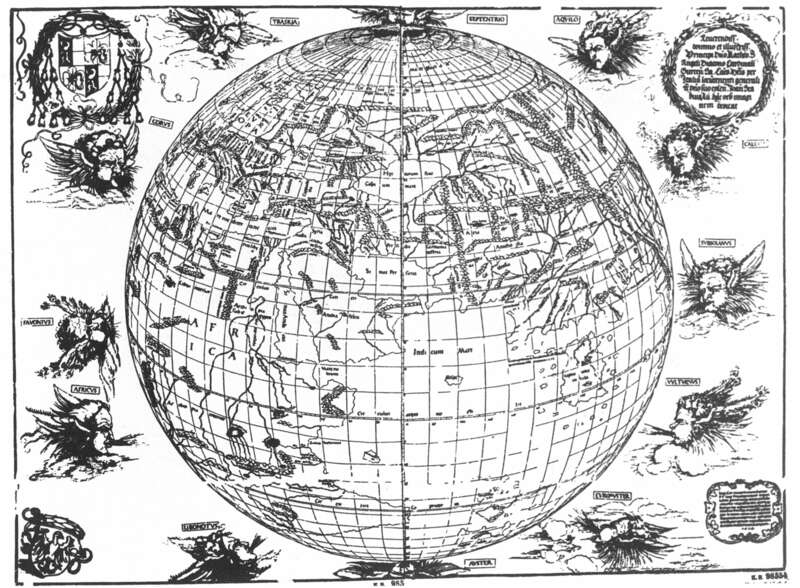 Also in 1515 Stabius and Dürer had produced a world map. Conrad Heinfogel (?–1517) (from whom there are no known portraits) had been a pupil of Bernhard Walther (c.1430–1504), who was Regiomontanus’ partner in his astronomical activities in Nürnberg and who continued his work after Regiomontanus died; some of his observations of Mercury would be used by Copernicus in De revolutionibus. 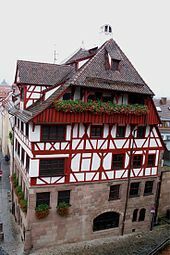 Walther had owned the Dürer House before Dürer and this was one of the reasons that Dürer bought it. 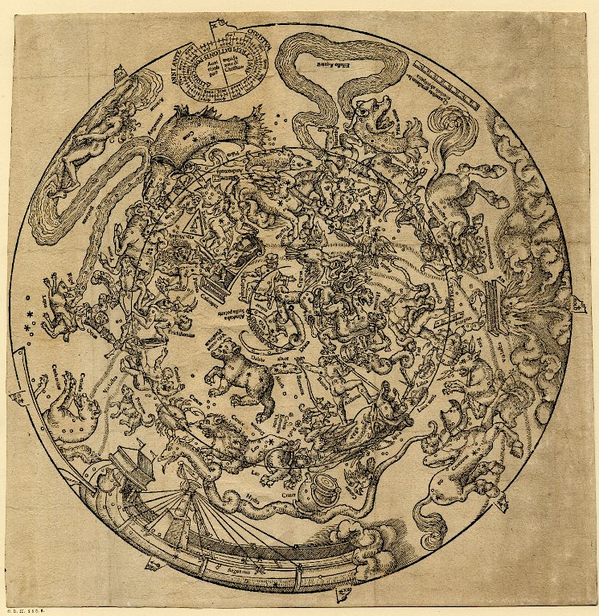 Amongst his other astronomical activities Heinfogel was employed to position the stars on a set of manuscript star maps produced in Nürnberg in 1503. This earlier set of maps almost certainly served as one of the templates for the 1515 Dürer maps. A probable second source for the maps was a 1435 set of manuscript star maps of unknown provenance now found in Vienna. However the means of transmission of the information from Vienna to Nürnberg is not known. 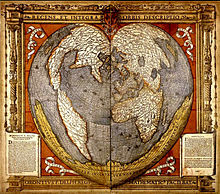 In the top left hand corner of the southern hemisphere map is the coat of arms of the Archbishop of Salzburg, Cardinal Matthäus Lang and in the top right hand corner a dedication to him. Lang was a fervent supporter of the sciences and it was he, for example, who commissioned the first account of Magellan’s circumnavigation of the earth on which Johannes Schöner based his 1523 globe displaying the route taken. The bottom right hand corner is an acknowledgement of Maximilian I, patron to both Stabius and Dürer. The four corners of the northern hemisphere map contain portraits of astronomer/astrologers: Top left Aratus 4th century BCE author of the Pænomena an astronomical poem. Top right is Ptolemaeus. Bottom left is Manilius a 1st century CE Roman astrologer, whose astrological poem Astronomica Regiomontanus had published in Nürnberg in 1473. Bottom right is the 10th century CE Persian astronomer al-Sufi, author of a famous star catalogue. The two star maps are bounded by the ecliptic and contain all of the 1022 stars from the Ptolemaic star catalogue with the Ptolemaic numbering. 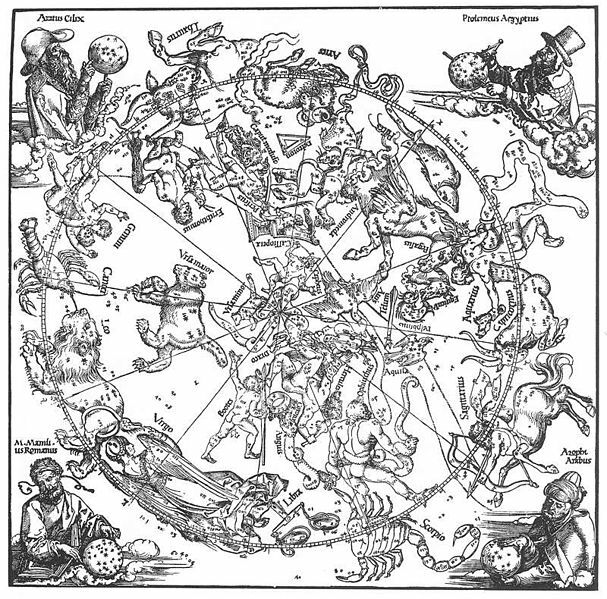 Dürer produced the images for the forty-eight Ptolemaic constellations. 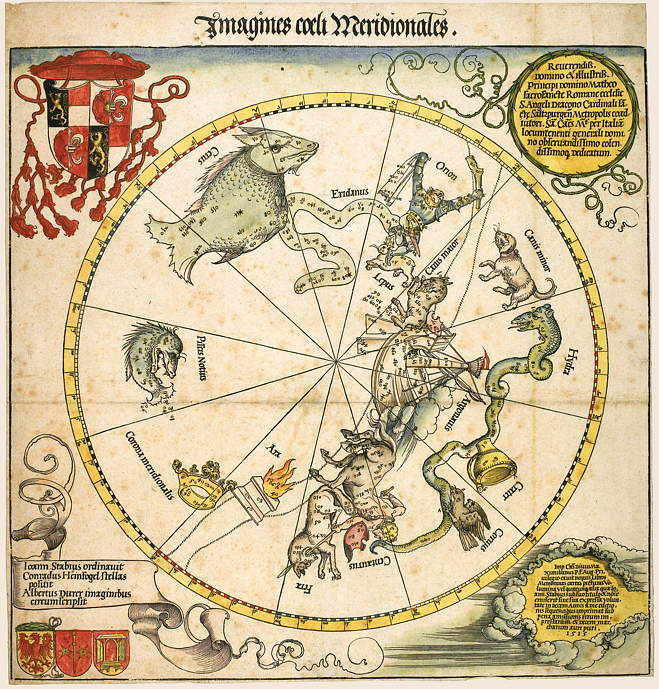 The maps set new standards for star maps in the Renaissance and, because printed and widely distributed, influenced many star maps and celestial globes in the following century. 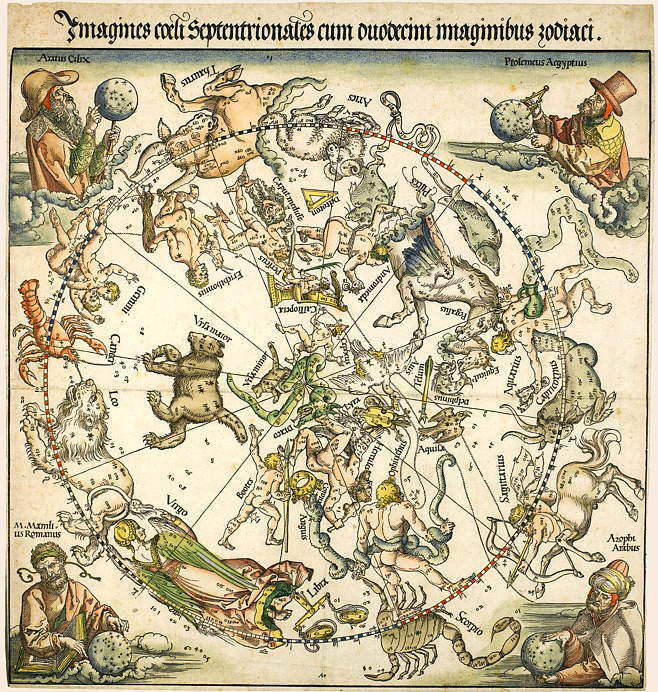 Hans Gaab has identified about sixty such objects most notably Peter Apian’s star map from 1535, a rather unsuccessful attempt to include both hemispheres onto one chart. 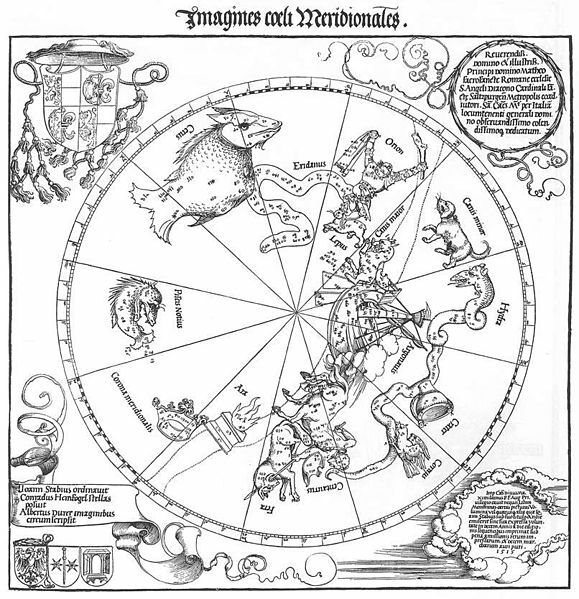 Following the publication of Tycho Brahe’s new and much more accurate star catalogue at the end of the century the Dürer maps ceased to be influential. If you can read German and wish to know more Hans Gaab, who is a fount of wisdom on all things astronomical historical in Nürnberg, has written a book on the Dürer Star Maps, Die Sterne über Nürnberg: Albrecht Dürer und seine Himmelskarten von 1515 (Schriftenreihe der Nürnberger Astronomischen Gesellschaft) that was officially presented on Friday as part of the celebrations, highly recommended. Seriously, these two Dürer posts are terrific. 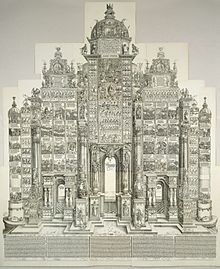 My major complaint about the BM’s posts, which I have made several times on Twitter without any response from the BM, is that they make absolutely no mention of Stabius or the second (actually primary as I learnt at the conferrenc) artist, whose name I have unfortunately forgotten, in their discussions of the Arch. They leave the impression that it’s was all just Dürer and that is not good.